This is one of the items from my bucket list that has been completed... Design a huge piece of art. A few years back our company decided to participate in the "Cow Parade". Designing the cow, coming up with a cool name, and constructing this massive piece of art took of all one summer and many helping hands. Miss Heifer took up residence in our dinning room. She came in one spring a mere 80 pounds and left a hefty 200 pounds in the fall. Completely covered with the reflective paper you see on bill boards (that kind that make diamonds sparkle) plus hundreds and hundreds of acrylic ice cubes painfully glued on by hand one by one. Each cube had to be held until it set. With her beautiful blue eyes and fabulous eyelashes, she was sure to win someone's heart. After her incredible makeover was complete she left to be auctioned to the highest bidder to raise funds for The Connecticut Children's Medical Center and the Hartford Foundation of Public Giving. After many hours of helping hands we were left with great memories and a fabulous piece of art. You must admit she was stunning! 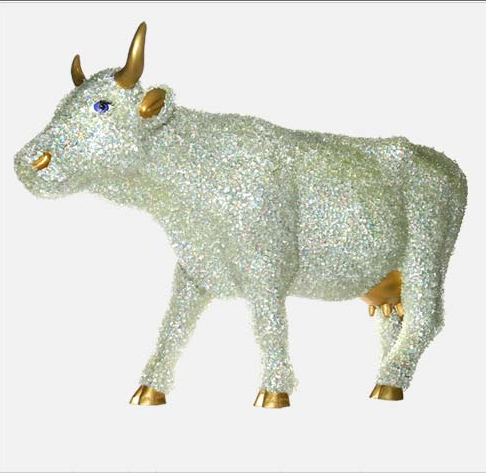 and here she is "Diamonds Are For Heifer".